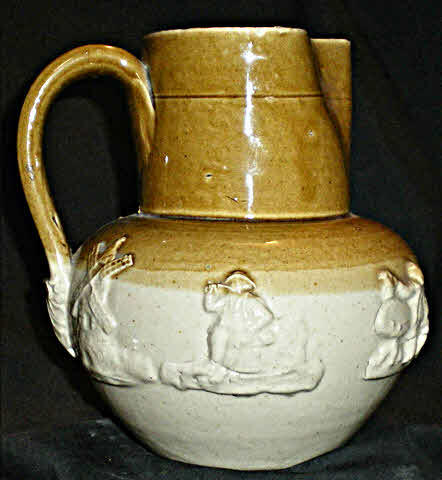 Wales has a long history of ceramic production ranging from the country potteries of Buckley in the north to the fine porcelain of Nantgarw. 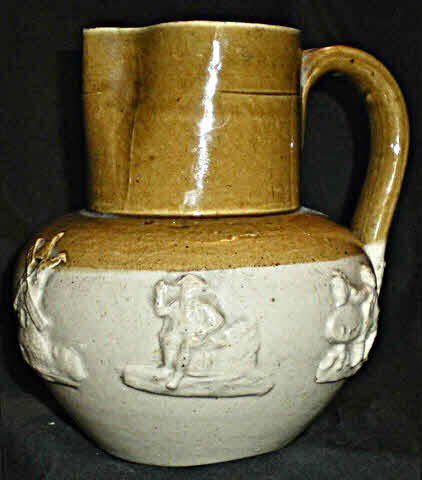 The Cambrian Pottery at Swansea was in operation from the 1760s to 1870, producing a wide range of earthenware and porcelain. 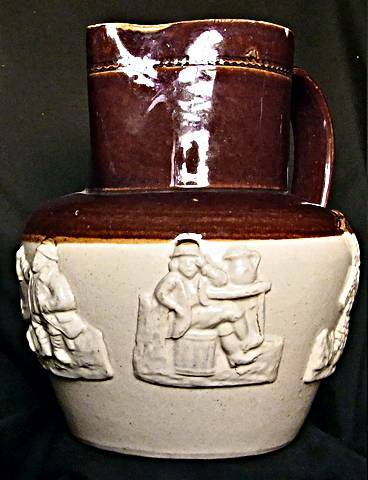 Unfortunately Welsh production of stoneware seems limited to "Bristol Glaze". 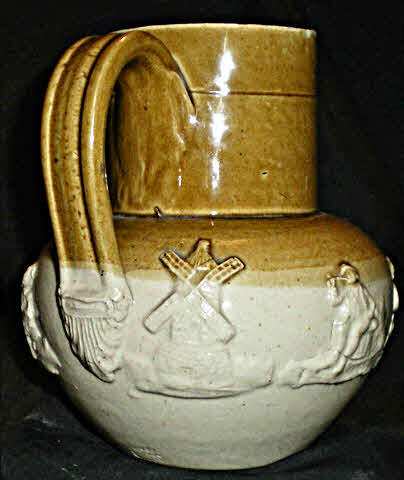 Flagons, bottles and a few jugs have been recorded with the mark "PRIEST CANTON CARDIFF". 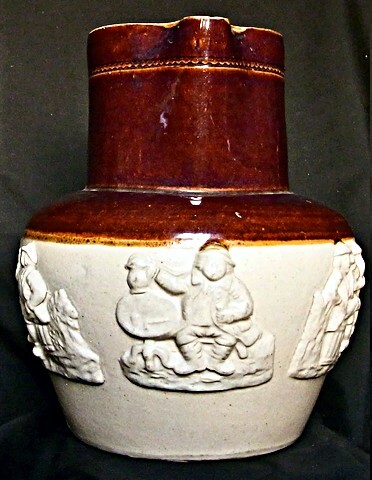 George Priest was born in Bristol and moved to Cardiff about 1857. He is recorded in trade directories as a pipe maker (from 1863) and also a publican. He is recorded at various addresses in Wyndham Crescent, Canton, the last being number 15 which he occupied until his death in 1907. 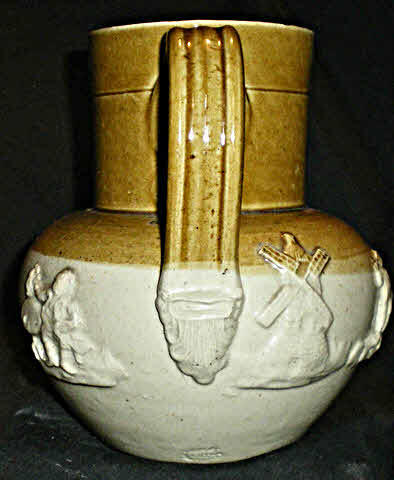 Pipes continued to be made at number 15 until the early 1930s. Wyndham Crescent was popular with pipe makers, seven premises in that one street being used for pipe making between 1880 and 1900. * Although maps showed that number 15 had workshop facilities at the rear it was thought by some (including me) that the site was too small to house a stoneware pottery. However research by Mike Squires, Secretary of the Dorset Bottle Club, has proved there was one, and he has given me permission to reprint what he published in issue 37 (January 2015) of Dorset Digger, their club newsletter. * Information from "Some 19th and Early 20th Century Cardiff Clay Pipe Makers by D.H. Evans, 1981"
A number of GBs are known with the pottery mark ‘Priest Canton Cardiff’ , the three cork stoppered Dorset examples shown above all probably date to the early 1900s. 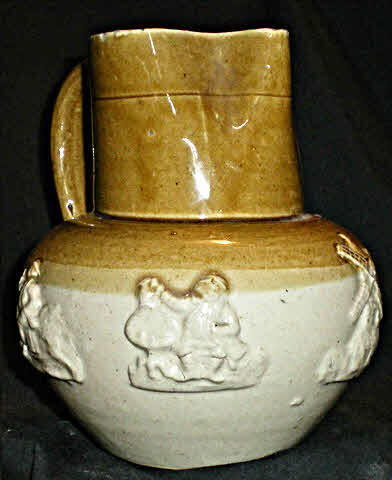 The pottery also produced flagons up to at least 4 gallons and cream pots with the same pottery mark. 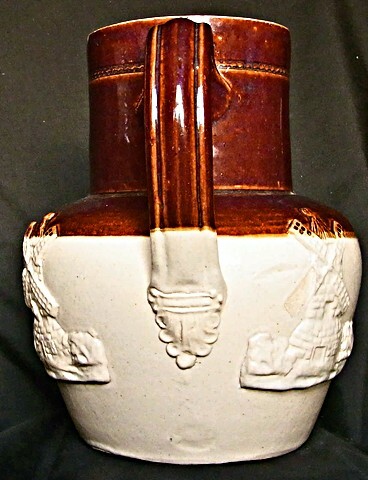 Until recently I knew little about this pottery, there was no information in Askey apart from a brief mention and my searches had previously not found out any further details. 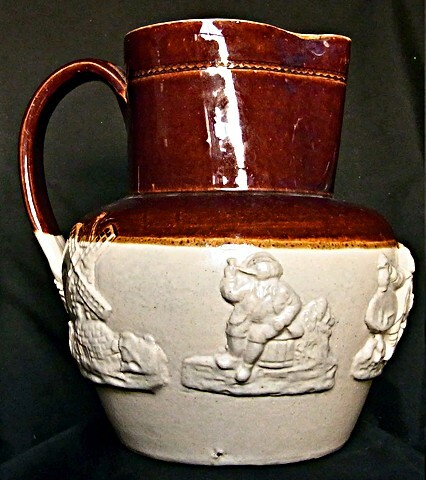 I saw that the pottery was mentioned on the Brown Jugs (web) site. 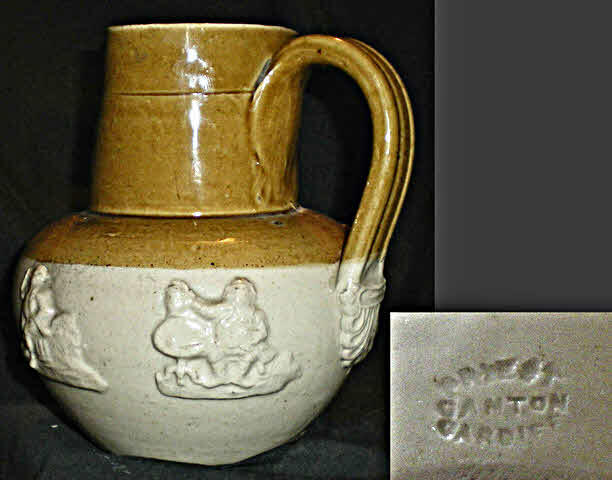 There was some research on the likely company, George Priest a pipe maker and hotel owner of Canton Cardiff, but the conclusion was that the stoneware was probably not made in Cardiff. 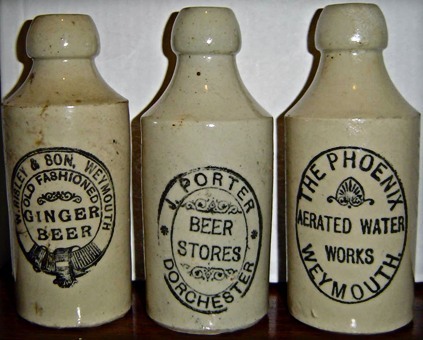 I felt sure that the bottles would have been made at Canton, Cardiff, so was spurred on to do some further internet research. Initial research confirmed that George Priest born in Bristol was a pipemaker at Wyndham Crescent, Canton, Cardiff during the period of interest- the 1880s through to 1900s. Map research also showed that by 1900 Wyndham Crescent was a fairly built up area, although there was room for a stoneware pottery on the land behind the houses there , it was not the most likely looking area for a pottery! The SUBSCRIPTION LIST will open on WEDNESDAY August 1st and close on or before SATURDAY August 11th. Capital , £14,000 to be divided into 14,000 ordinary shares of £1 each. 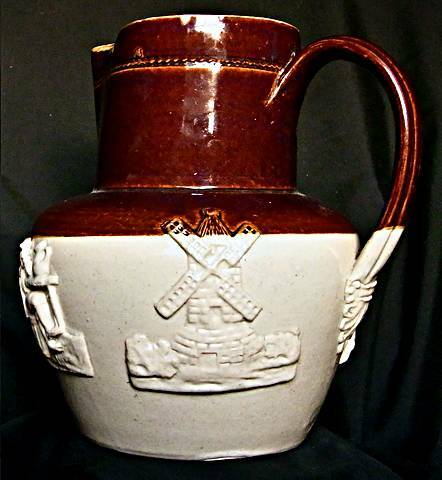 This company has been formed for the purpose of acquiring and developing the business of the Stone Ware and Tobacco Pipe Manufactory, carried on for the last 40 years by Mr.George Priest in Wyndham Crescent, Canton. The property consists first of a Dwelling –house (used as an Office), Warehouses and a kiln held under a lease for 99 years from 1857 at a ground rent of £7 11s, and another piece of land with a yard and dwelling house adjoining with two kilns and other buildings held for a term of 49 years from March 1895 at a rent of £80 per annum. 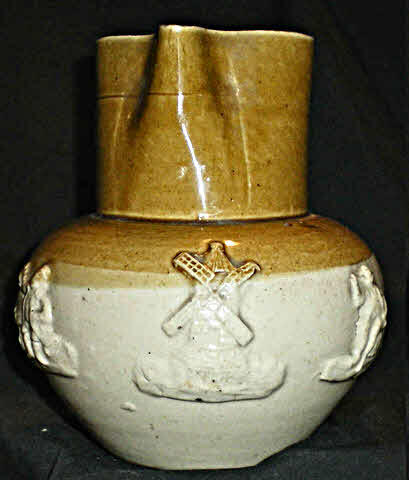 On these two pieces of land have been erected the Kilns and Warehouses, Drying Rooms, Packing Rooms and workshops and at the present time 50 hands are employed in the manufacture of Tobacco Pipes, Stone Ware, Spirit Jars, Beer Bottles, Flower Pots, Ornamental and Plain Stone and Terra Cotta Ware of various kinds. Mr. Priest is prepared to sell the whole property as a going concern for £10,500. It is anticipated that with additional working capital a much more extensive business may be carried on, for the connection is a very large one throughout South Wales, Monmouthshire and the West of England. The management which has hitherto been so successful will be continued, and Mr.Priests services have been secured for 6 years. Priest even made sprit flagons for London customers so output must have been significant. 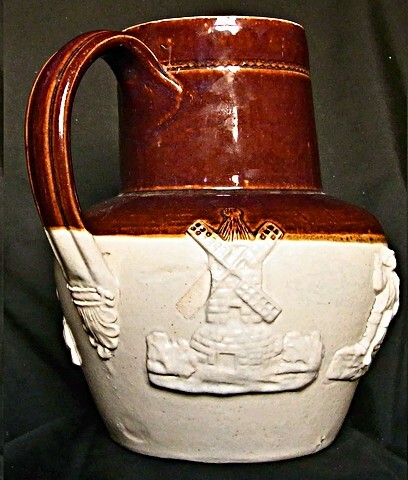 A few 2 and 3 pint sprigged jugs have been recorded, very similar to Bristol made examples from J.G. Hawley, suggesting either collaboration or sub-contracting.